A Day Late and A Dollar Short: Dollar General - Summer Clearance - All Items $.10! Dollar General - Summer Clearance - All Items $.10! A few dimes can buy you a lot starting this Tuesday at DG. 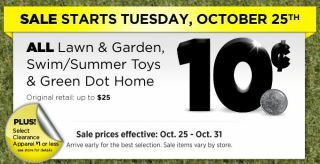 All Lawn & Garden, Swim/Summer Toys and Green Dot Home items are just 10¢ each! Sale starts 10/25--get in early for best selection. Need items for church, stockings, etc.? This might be a great time to stock up!